What would the optimum blend of bicycle composition ingredients from Bicycle Quarterly/Jan Heine and Rivendell/Grant Petersen look like for you? The Ocean Air Cycles Rambler shown above might be my version. In the last several years, I have been heavily influenced by the admirable work of Grant and Jan. But there are significant differences between them. For awhile, I thought I must choose to become a cycling disciple of one…or the other. After a little experimentation (and a lot of dollars), I finally realized what is probably obvious to you. Perhaps there is a way to identify and use the best of each “philosophy” or “approach” to enhance what I personally do with a bicycle. I didn’t set out to create some sort of “in-between-er”. On today’s outing, however, I realized how much I enjoy certain features that both influences have given me. This blend of two different influences just sort of evolved. What follows is an illustration of what I mean. It is not my purpose to claim this is an optimum blend for everyone. If you look carefully, no doubt certain discrepancies will become apparent. But I’ll mention of few of the things that stand out for me. Who knows? Maybe someone else can benefit from all this somehow. Rivendell was probably the biggest influence on how I USE a bicycle. The whole “unracer” and “just ride” philosophy which suggests riding is possible without lycra was liberating. Now I enjoy platform pedals, upright bars, and even have a basket to carry things I want (not just need) to have with me. Rivendell showed me the benefits of slacker frame angles and a longer wheelbase. I was able to focus on comfort and let speed cease to be my master. My bike weighs as much as it needs to maximize fun. It was Rivendell that introduced me to S24Os and a kind of casual, hobo aesthetic that matches my personality. Bicycle Quarterly taught me certain technical aspects to help make what I do with a bike even more enjoyable. I learned that more flexible frames can be more “lively” and work with a rider to be less fatiguing and make climbing a little easier. The articles on low trail frame design described how front loads could be carried easier. The magazine is also where I learned about the benefits of dynohub lighting systems and wider tires with supple casings. Each of these technical insights has elevated comfort, ease, and convenience of my cycling. Each is complimentary to my riding style, and even seems to blend well with so many of the things I have embraced from the Rivendell influence. So it feels like, in some accidental way, I’ve ended up with a bicycle that blends many of my favorite features from both of my major influences. It was a delightful outing today, if a bit soggy. It would have been nice to have fenders on my bike today. Maybe I’ll turn to my two great influences for guidance. First, to your question: plastic. Unless you’re really into fenders (I’m not) the SKS ones seem adequate. Granted, I live in a dry area & they don’t see much use, so maybe metal is better in Portland or Seattle; Texas? Good question. On a larger note, your experience really mirrors mine. One forum post I made a long while back was if only we could hear Grant & Jan’s opinions on a particular topic we’d be able to make a good choice. I’ve loved my Atlantis from day one but after a few years kept fiddling with stuff & bought into Jan’s “low trail” thing. I then had a custom fork made but not truly low trail, sort of reduced trail from stock. Absolutely perfected the Atlantis for MY riding style, loading preferences, etc., (YMMV). Jan loves centerpull & canti brakes; I love V-brakes. Grant loves front baskets; I’m attached to my Acorn Rando bag (never done a rando). We all work it out for ourselves. As to your Rambler choice, I couldn’t agree more. Rob really hit the mark with that design. Were I buying a bike today, that’s where I’d be looking. A bit lighter & more sporty than my Atlantis. Front loading design. Spot on for the type of riding I do. Thank you, Doug. You are encouraging as always. Why do some of my best friends have to live so far away?! I totally understand this blending of philosophies. I know I have been influenced by G.P., with S240’s, Bikeovernigth.org, and to a lesser extent by Jan. I discovered Panaracer Pasellas, not through Jan, but by Ryan at Ryan’s Rebuilds, though I read and am interested more about the supple casings, less tire pressure and comfort approach. But what I find truly heartening is the wider acceptance that it’s okay to ride with upright bars, wider tires, and wearing whatever clothing makes us feel comfortable. Aye, the bond between those that enjoy gliding through the countryside on two wheels is beyond what we ride and how we dress. From my experience (I’ve tried both) I would vote for metal fenders. They’re actually lighter than plastic, stiffer and nicer looking. The downsides are expense and a little more mounting difficulty. I would also second the Bicycle Quarterly advice to make the fenders plenty long and add a mud-flap to at least the front one. Thanks for the blog! 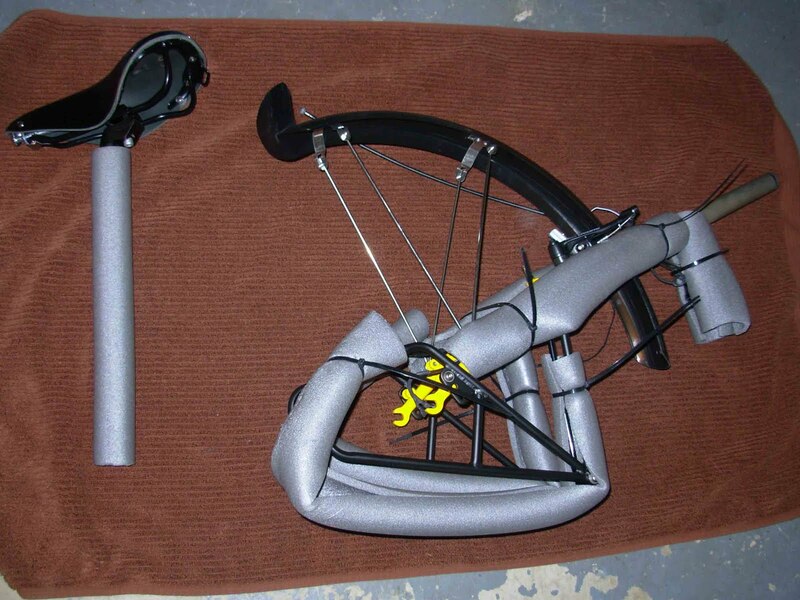 I’ve tried both also, and for now I’m leaning more toward the Rivendell influence on fenders. I agree with your comparison, and find myself valuing lower cost and ease of mounting. But that could change. Soggy it was, all of last week. I only rode a couple of days though. My tires still have lots of dried mud on them. The bike looks great with all the nice additions. How are you liking the bigger KleenKanteen (spell) bottles? Thanks, Chandra. I enjoy my stainless steel bottles. The water tastes better, and I usually have at least one insulated one with me to help regulate temperature. To me they are simply more enjoyable to handle and use than plastic bottles. Same here my friend! I use SS bottles also. With all the rain we’ve had in Texas over the past year, I finally broke down and installed the SKS fenders that Rivendell sells. They work very well for the price. In the drought/flood Texas climate we live in, fenders can be unnecessary for years at a time. I used Sheldon’s fender nuts to make for a quick and easy removal once the rain goes away. If I were in Seattle, I’d probably go for a different solution. I ride the poor man’s Rivendell, the Soma San Marcos. Thanks, Mike. I think I’ll give the SKS P55s a try. Chris, those of us who appreciate the type of riding and equipment that Grant and Jan espouse are indeed fortunate to have benefited from their passion, dedication, experience and perseverance. As for the fenders, I’ve used both types and currently have SKS on my Sam and ’85 Trek single speed. My Atlantis looks better with metal fenders. When you need ’em any fender is a good fender so for me it’s about the aesthetics. Did you go with a longer stem to get the bars in the correct position? Many people do add a longer stem when switching from drop bars to this kind of upright bar. But I didn’t need to do that in this case. I believe I’d need a longer stem if my bars were higher. ‘Nother vote for SKS fenders. I’ve built a wonderful 650b conversion from my old touring bike and don’t see the point in metal fenders. The SKS work wonderfully and I’ll never pay a big dental bill from flipping over the bars when a stick gets caught in the front. Mine are currently 45mm Longboards fudged to (barely) cover the 42mm Pari-Moto tires. I’ll replace them soon enough with wider 55mm. You will soon find that the low trail geometry is affected by rear loads. As long as the front is loaded heavier the rear will be fine. When running a heavier rear load the bike will feel like it’s pulling a trailer, the steering will oversteer dramatically and the whole bike will feel odd. Load the heavy weight up front and keep the rear lighter and it’ll ride like a normal bike. At least mine does. Love to keep up with your blogs…ENJOY!! Thanks for the tips. I am looking forward to trying the Rambler with a camping load. When I do, I’ll keep your loading advice in mind. 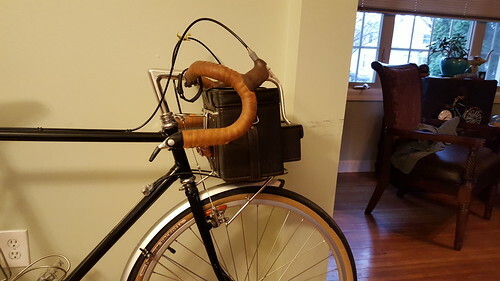 Also if you (or anyone on the webz) are ever looking for a cool way to add a “rando bag” to your bike for super-duper cheap, old leather camera bags are the perfect size and shape! Just have a shoe repair shop add some leather squares with slots for toe straps to the back and bottom! Looks super classy and chic and yet total spent (for mine) was under $30!! Ebay!! Well, that’s clever. I’d love to see a photo. and there’s more in the flickr account. Excellent. I love to see clever and resourceful things like this, especially since I am so bad at it. Thanks for the inspiration to improve myself.